The first day at school as a student or a teacher can be nerve-racking. If you’re thinking about coming to study English with us, you may be interested to know what to expect from an English class at Q Language in Hong Kong. 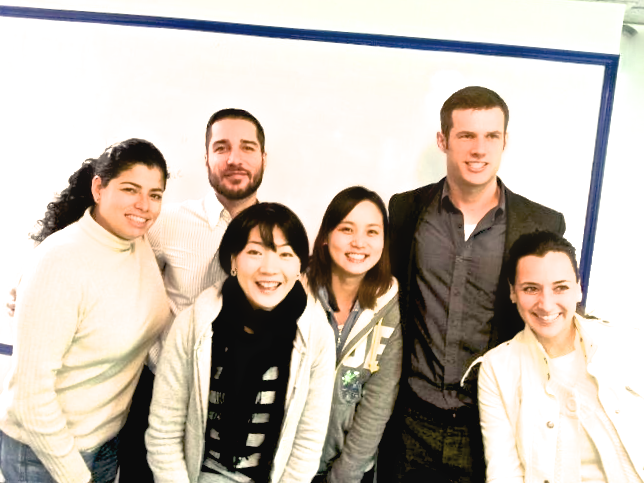 Byron with some of his students studying English at Q language. When I first started teaching at Q Language, I didn’t really know what to expect in the classroom. I had taught children before, and this was my first time teaching a room of adults. As you can imagine, I was pretty nervous on my first day. I went to the teachers’ room early to prepare the materials for the day and then walked into the classroom to wait for my students to arrive. That was almost four years ago, and all those students moved on to their jobs or universities long ago; but I still remember some of them. Although it was my first day, it was not theirs. They immediately showed me how eager they were to learn English. They showcased their small-talk skills with a flood of questions, and within five minutes they had set me at ease. I quickly grew to appreciate the intimate and informal classroom setting in Q Language classrooms. With only six to eight students, classes feel much like friendly get-togethers. The English classes I teach are three hours long. This allows us to cover the material very thoroughly and also to practice the different facets of using English: speaking, listening, reading, and writing. Every class begins with small talk. This is a time for students to practice speaking and for us to welcome new students into the class. We always enjoy hearing about new students’ backgrounds and reasons for moving to Hong Kong and studying English. Students enjoying a little bit of small talk. After opening small talk, we review the material from the previous lesson. I ask the students to explain the material back to me as if I were the student and they were the teachers. Students may use the whiteboard to help explain the grammar point or the vocabulary; the floor is theirs. Then we go through the homework from the previous lesson. I usually give a little bit of homework at the end of every lesson in order to encourage the students to review the grammar point of the day. If the students have the right answers on their homework and seem to find it easy, I know that I can continue on to a new grammar point. But if the students seem to be struggling to understand the material from the previous class, I delay the new material and spend more time reviewing. After the previous lesson’s material is reviewed and the homework is checked, I introduce the new grammar point to the class. Up until this time, I try to keep as quiet as possible, encouraging the students to talk. The new grammar point is my time to lecture. I use example sentences and textbook diagrams to explain the grammar point as clearly as I can, then I take questions and give some practice exercises. In between grammar exercises, I encourage some speaking practice with the grammatical structure we’re covering. Practice through real communication is much better than just filling in blanks in a textbook. After about an hour of grammar, class is halfway finished and it’s time for a 15-minute break. The whole school breaks at the same time, and the students and teachers flood into the neighborhood cafes and juice shops to get a drink and a snack. After the break we finish up the grammar work and begin practice with reading or listening. I recently found some excellent short story books that my classes have been enjoying reading. In class we go around the room student-by-student, each reading a page at a time. This is excellent practice for pronunciation, and a great way to learn new vocabulary. Sometimes, instead of a storybook, we read a newspaper article or a short essay meant especially for English language learners. Working hard on the new grammar point. I check reading comprehension and encourage speaking practice by asking questions about the text. Sometimes I have my students write an essay about the text. Sometimes, instead of assigning a reading text, I show a video clip or play an audio clip. Understanding recordings of native speakers is quite difficult for most students, so we watch the video clip or listen to the audio clip at least twice. There are questions and discussion to check comprehension and practice speaking. We finish class with a final few minutes of talking about plans for the afternoon and reminders about homework. I’m always available for a few minutes after class for one-on-one questions and to provide extra practice work for anyone who wants it. It is a great pleasure for me to talk to a student who is interested enough to ask questions after class. Hi, my name is Jairo and I want information about fees and visa sponsorship. I want to study 6 months in Hong Kong before I travel to Australia to take a Master Degree. I want to know, if I can work in Hong Kong as full time English student. Thank you in advance. Thank you for your enquiry, Jairo. We have responded to your request via email.